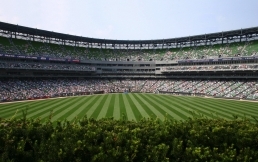 Cisco Coliseum Image – Michael King. 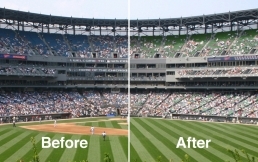 When the ad agency Envision Media hired me to perform advanced Photoshop work on this image for Cisco Systems, they asked me if it was even possible to alter the image so extensively: Cisco had requested that we remove the baseball game from the playing field, change the color of the seats from blue to green, and populate the bleachers with more fans. I exceeded Envision’s expectations. The before-and-after image below shows the results.